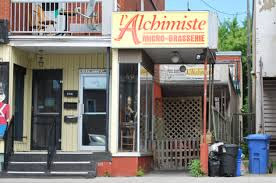 In this months Beer of the Month Club package were three India Pale Ales from Microbrasserie Alchemiste's. I really love IPAs and was looking forward to trying these, but first a little about the brewery. The original brewery was opened in 2001 as a brewpub in downtown Joliette by owner Carl Dufour. At first the brewery's beer was only available on tap at the pub. Due to demand though, the brewery starting selling it's bottles at local stores, first in large bottles, then in regular size bottles. By 2006, demand was so great the brewery part moved to an industrial park in Joliette to increase production. The ale pours brown in colour with a light brownish head. I had expected hops to be present in the aroma but was surprised to find it quite malty. The ale had a nice head, and nice lacings were left behind as I sipped. It was quite interesting the way the taste changes during a sip. At first I was met with a very nice hop bite that disappeared rather quickly. The ale seems almost tasteless at that point and there is no finish. However, seconds after I swallow, an excellent surge of hoppy bitterness comes fighting back. This happened sip after sip after sip and was the same with the second bottle. I really enjoyed this IPA and the next time I'm in Quebec, I'll be on the search for this. I think it would be also very interesting to try on tap.